Hope and history really do rhyme sometimes. 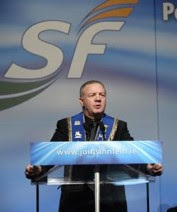 Here is Raymond McCord snr, wearing an Orange Order sash 'his father wore', addressing last week's Sinn Fein Ard Fheis. 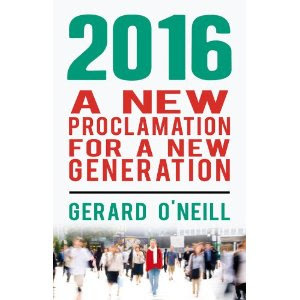 He was there campaigning for an inquiry into the murder of his son by the UVF in 1997. I grew up a Catholic in Northern Ireland through the grimmer decades of The Troubles, and the many-layered symbolism of this picture strikes a deep chord with me. Of course, the story behind the picture is one of politics, not religion. But the story of conflict in Northern Ireland was about religion - and economics, politics, culture, identity etc etc. Nevertheless the role of religious faith and practice was an essential element in creating and sustaining the conflict that lasted more than four decades. This is not an argument for the 'God Delusion/God Is Not Great' school of religious criticism popularised by the likes of Richard Dawkins and Christopher Hitchens. They see religious belief as inherently 'evil' as evident from its history. But having seen religious hatred and sectarianism up close, it seems to me that religion's capacity for evil lies is the way in which it can easily becomes a tool for politicians intent on securing power at the expense of others. Science has the same capacity of course (after all, it is politicians who create the demand for nuclear bombs: not scientists, priests or business people). In The Brothers Karamazov, Alyosha expresses the idea which panicked Dostoyevski more than any other: Without God, 'everything is lawful'. But as Mohammed Atta can explain, the opposite is true. Without God, murder is forbidden by human law; it is only for those acting on behalf of God, that everything is permitted. So perhaps it is not religion we should fear but rather those who claim to have a direct line to God and to know exactly what she/he/it wants. Still, maybe I am being naive: perhaps the universal propensity towards religious belief means that we are doomed to suffer at the hands of another Torquemada or Calvin for as long as we have religion? And not just the Christians, will Islam always be a victim of Islamism? Yet, as the image of Raymond McCord speaking at the Sinn Fein Ard Fheis shows, things do change for the better. Reason can triumph over blind faith - though it is not inevitable that it will do so. On balance, I am optimistic about the fate of religion in human affairs. Though I don't expect a dawn of Faith 2.0, as the Financial Times recently called it. Rather my optimism is inspired by the philosophical writings of 'post Christians' such as Don Cupitt; and the brave, ongoing work of historians such as Thomas Sheehan. Hope and religious history might also rhyme some day.